Airdrie (/ˈɛərdri/; Scottish Gaelic: An t-Àrd Ruigh) is a town in North Lanarkshire, Scotland. It lies on a plateau roughly 400 ft (130 m) above sea level, and is approximately 12 miles (19 km) east of Glasgow city centre. 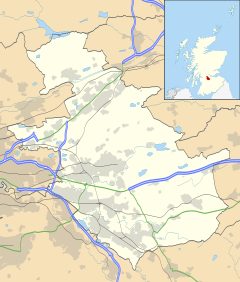 Historically part of Lanarkshire, Airdrie forms part of a conurbation with its neighbour Coatbridge, in the former district known as the Monklands. As of 2012[update], the town had a population of around 37,130. The origin of Airdrie's name first appeared in the Register of the Great Seal of Scotland (Registrum Magni Sigilii Regum Scotorum) in 1373 as Ardre. By 1546 it had become Ardry and by 1587 it was known as Ardrie. In 1630 it finally appeared in the Register as Airdrie. Given the topography of the area, the most likely interpretation is that the name derives from the Gaelic An Àrd Ruigh meaning a level height or high pasture land. Another possibility is that it is from the Gaelic An Àrd Àirighe meaning a sheiling, a summer pasture/shepherd's hut. A third possibility is the Gaelic Ard Reidh meaning a high plain. A further, non-Gaelic alternative is the Brythonic, i.e. Cumbric or North Welsh, ard tref (becoming ardre by process of assimilation), meaning a high steading or farmstead, which would date back to the times of the Kingdom of Strathclyde, before the expansion of Gaelic or English speech into the region. Airthrey in Stirlingshire may have a similar derivation. Chapelhall, Calderbank, Caldercruix, Gartness, Glenmavis, Greengairs, Longriggend, Moffat Mills, Plains, Stand, Upperton and Wattston are generally considered satellite villages of Airdrie. Chalmers' claim in his book Caledonia of a link between the modern town of Airdrie and the ancient battle of Arderyth has no evidence to back it up and is therefore best regarded as spurious. Under the patronage of King Malcolm IV of Scotland Cistercian monks established an abbey at Melrose in 1136. Five years later a daughter house was founded at Newbattle Abbey in Lothian. In 1160 Malcolm granted to the monks of Newbattle lands in central Scotland which became known as the "Munklands" (Register of the Great Seal 1323). Malcolm's Charter constitutes the oldest documentary record of place-names in the Monklands. The area of land granted by the Charter is clearly defined by direct reference to geographical and topographical features thus: Dunpeldre by its right boundaries, namely with Metheraugh and Mayeuth and Clarnephin as far as Dunduffes in the east. The name Dunpeldre is found in the modern name Drumpellier; Metheraugh is now Medrox; Mayeuth is now Myvot; Clarnephin refers to the North Calder Water in the east of the parish (from old Brittonic name claur n afon meaning plain of the river); and, finally, Dunduffes has become directly translated into the modern Black Hill which, as the Charter states, lies at the eastern extremity of the parish. The one thing this Charter does not make any reference to is anything resembling Airdrie yet this is where Airdrie is located. Blaeu's map based on Pont's original "Glasgow and the county of Lanark" map c.1596 depicting Ardry (Airdrie), Burnsyd (Burnfoot), Carnhil (Cairnhill), Gartly (Gartlea), and Ruchsols (Rochsoles) amongst others. Airdrie owes its existence to its location on the 'Hogs Back' – a ridge of land running from east to west. One very important aspect of the town's history was the Cistercian monks of Newbattle Abbey, which is why the area is called the Monklands. The monks were farmers and some of their place names survive, e.g., Ryefield and Whifflet (the wheat flats). Much of the land they used is known today as 'The Four Isles' (a housing estate named after four Scottish islands): Mull, Islay, Iona and Luing in the Petersburn area of modern Airdrie. The monks of Newbattle had numerous establishments throughout the area including a farm grange at Drumpellier, Coatbridge, a court house at Kipps, a chapel in the area of Chapelhall and a number of corn mills. The Monks were also expert in the construction of roads. In the 12th century, they established the original Glasgow to Edinburgh road via Airdrie and Bathgate, to link up with their lands in Newbattle in East Lothian. In those days travelling was often dangerous. Horses were still uncommon and could only be afforded by the rich. Low-lying ground was usually extremely difficult to navigate because of the numerous bogs, forests and burns – not to mention the possibility of ambush by a footpad or robber. Hence, it became much more practical to travel on the high ground (the 'High Way') where one could avoid the mud and the robbers. These roads (or rather tracks) became known as the King's Highway. Definitive evidence of the existence of Airdrie as a tenantry was only made clear in 1503. The old monks' road was via Cliftonhill (an area now in neighbouring Coatbridge), Airdrie House (now the site of Monklands Hospital), Aitchison Street, High Street, Hallcraig Street, Flowerhill Street and Colliertree Road. It was along this road that the first houses in Airdrie were built. Development was slow and it was only around 1650 that evidence of the number of inhabitants was known at around 500 for the Airdrie area. A large contingent of Airdrieonians fought at the Battle of Bothwell Brig during the Covenanter Rebellion of 1679; their banner can still be viewed at the local library. A significant event in Airdrie's history was the 1695 passing of a special Act of Parliament in the Scottish Parliament allowing Robert Hamilton of Airdrie to hold four fairs yearly and a weekly market in the town of 'Airdry'. This helped develop Airdrie from a 'farm town' into a thriving 'market town'. However, Airdrie really came to prominence through its weaving industry. Airdrie Weavers Society was founded in 1781 and flax was being grown in sixteen farms in and around the burgh. In the last decade of the eighteenth century, coal mining was in progress and around thirty colliers were employed. Weaving continued to flourish making up a substantial part of the population of over 2,500 around the turn of the 19th century. Given its large number of weavers, its geographic location, and a large number of unemployed soldiers following the end of the Napoleonic Wars, Airdrie became a major centre of support for the Radical War of 1820. The rapid pace of population growth continued and by 1821 there were 4,862 inhabitants. At this time the number of houses being built increased dramatically and in 1821, by a private Act of Parliament, Airdrie became a free and independent Burgh of Barony. Due to the fact it was 'independent', it had all the powers of a Royal Burgh. Voting in the early part of the nineteenth century was rather hit or miss as not only locals but residents outside the burgh were allowed to vote. In 1821 the first election of a town council took place and by August it had appointed an assessor, procurator fiscal, master of police and a town crier. Anyone who had paid their 3 guineas was allowed to vote; there is even a record of a John Mackay voting despite being under 10 years old. 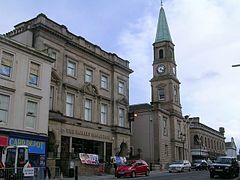 In 1824 it was decided to build the Town House, which was originally designed by Alexander Baird and is now a local landmark known as the 'town clock'. In 1832 the Town House was used as a hospital due to the cholera outbreak of this year. By 1850, the population had grown to 12,418. The enormous growth in population was not due to high birthrate, but instead due to an influx of residents from the Highlands and predominantly Ireland. This followed the Highland potato famine of the mid-1840s and also reflected the change from cottage industry to heavy industry in the area. Most of the Irish immigrant population were involved with mining and labouring. This led to an increase in ironwork foundries around the area. Because of this explosion in industry, railway links were established starting in 1826. By 1862, the Airdrie and Bathgate Junction Railway provided a direct link to Edinburgh with Airdrie South Station providing the starting point for trains to Glasgow. In August the Public Libraries Act (Scotland) 1853 was passed, and in November Airdrie Public Library became the first in Scotland. The dramatic rise in population and industry prompted the need for more accessible water supplies. Until the mid-1800s, various wells were put in place feeding from surrounding streams in the area. These served to provide many houses with private wells. By 1846 Airdrie and Coatbridge Water Company was founded to construct (along with Forth and Clyde Canal Company) the reservoir at Roughrigg. Journalism in Airdrie began with "The Airdrie Literary Album" in 1828. Several local newspapers began appearing around this time notably the Airdrie & Coatbridge Advertiser in 1855, which is still the most popular local paper today. The prison was legalised in 1859 and had 51 cells. Airdrie Working Men's Club was established in 1869. Also around this time, football and cricket began to emerge as popular sports. Following the codification of association football rules a local team called Excelsior was formed in 1878 which would later be renamed Airdrieonians. Horse race meetings were also held in the town (1851–1870) but this land became the golf course for the newly formed Airdrie Golf Club in 1877. Education posed a major problem with severe overcrowding in the few schools available, therefore three new school boards were established. In the early 1830s there were about 800 pupils while the town had about 7000 residents. Fees were routinely charged within the schools with the belief they should be self-supporting until a parliamentary act of 1889 relieved some of the infant classes in schools of this burden. Airdrie Academy was built in 1849 and by 1919 all school boards were dissolved and Lanarkshire Education Authority took over responsibility for education throughout Lanarkshire. Airdrie Public Observatory, one of only four public observatories in the UK (Second Oldest and Smallest)- all in Scotland, was founded in the first library building in 1896, and is still operated in the present building by the Airdrie Astronomical Association a Scottish astronautic and astronomy society and registered charity. By the turn of the century variety shows were becoming popular in the area and by 1911 the Pavilion in Graham Street was built which after initially being used as a music hall started showing cinematographic pictures. Unfortunately it was destroyed by fire in 1917 but was rebuilt in 1919 and finally closed in 1970. The New Cinema was opened in 1920 in Broomknoll Street but it too has since closed. The town had no suitable venue for larger functions so in 1912 the Sir John Wilson Town Hall was opened (following a generous offer from Sir John Wilson covering the total cost of £13,500). This still stands and is used for major events in the town. On the 9th of July 1918 nineteen miners died in the Stanrigg Pit Disaster. The pit was situated in boggy land and collapsed after being saturated by heavy rainfall. At the end of the First World War, Airdrie was hard hit with many casualties from the war. Many inhabitants also chose to emigrate around this time. Consequently, the population only rose by 3% to around 26,000 by 1931. The depression years had made a great impact on the town and several well-known manufacturers ceased to exist and few replaced them. It was reported that 50% of the registered population were unemployed. Church groups tried to provide some comfort for the poor folk in the area and set up educational and work experience projects to help and by 1936 the Airdrie Churches Council had attracted national interest through their work culminating in a building in Graham Street being provided for them (the Mutual Service Club). This is now Airdrie Community Centre. The current Airdrie Public Library building was eventually constructed on its present site in 1925 after years of moving from one site to another. The first Airdrie Public Library building, a Carnegie library opened 1894. Conditions in the town did not really improve until well after the Second World War but in 1949 the Boots pharmaceutical company and Banner Textiles Ltd were attracted to the town (between them employing 1200). With this impetus, new companies began to consider Airdrie as a viable option for business and in 1958 Pye opened employing over 1000 people. The emergence of industrial estates was also prevalent around this time (Newhouse, Chapelhall, and Brownsburn). The Airdrie Arts Centre opened in 1967 in the former Airdrie Library building and remained a popular venue for concerts and plays till it was closed in 2012 by North Lanarkshire Council but has recently been revenaved and modernised by the Council and has now been opened up again. The 1970s saw the opening of Monklands Hospital, which replaced an older hospital on the Airdrie House estate that had been closed in 1962 and demolished in 1964. Airdrie town centre has changed much in the last ten years with a new road scheme and a shift in emphasis with the type of shopping it offers. Graham Street, the main pedestrianised street, has recently been refurbished and has had the pedestrian precinct area upgraded. New housing developments are being built around this suitably situated commuter town, notably in Chapelhall, Rochsoles and Glenmavis, the former Boots factory site in Rawyards and the former Imperial Tube Works in Cairnhill. Airdrie also has signage in the Scots Gaelic language around the town centre, (alongside English) this was first introduced for the 1993 Royal National Mòd. The signs were originally erected by Monklands District Council, but have been maintained by North Lanarkshire Council. Airdrie & District Angling Club based at Hillend Loch, one of Scotland's top trout fishing locations. The Lilly Loch, run by Clarkston Angling Club. Roughrigg Reservoir, run by Roughrigg Angling Association. Airdrie Harriers, North Lanarkshire's largest athletics club. The town's major football club is Airdrieonians F.C., who play in the Scottish League One, and are based at the Excelsior Stadium. They were formed as a replacement for the original Airdrieonians, who folded in May 2002; in the immediate aftermath of the liquidation of Airdrieonians, a local consortium quickly formed to establish a new club named Airdrie United. Its application to join the Scottish Football League, playing in the traditional Airdrieonians colours at the Excelsior Stadium (now also known as New Broomfield after the club's former home from 1892–1994), was rejected in favour of Gretna. The owning consortium swiftly devised a Plan B, and bought Clydebank FC from its administrators. Clydebank's sole asset of any value was its place in the third tier of Scottish professional football. The new owners gained permission to move that club to Airdrie and change the name to Airdrie United, which latter club formally inherited the short life history of Clydebank rather than Airdrieonians. The United part of the name was dropped informally in July 2012, but the club was still officially known as Airdrie United F.C., until a move back to the Airdrieonians name was finally achieved in June 2013. The award-winning Gartcairn Football Academy fields a number of teams, including a junior team, Gartcairn F. A. Juniors. In addition there are a number of teams competing in the various Scottish Amateur Football Association leagues. Airdrie Golf Club was established in 1877. It is a wooded parkland par 69 course with tight fairways and well-protected greens. The Monklands Sporting Car Club runs it events at the Forrestburn Hillclimb situated about 5 miles east of Airdrie. Airdrie was home to its own rugby union team called Waysiders RFC. This team was amalgamated to form Waysiders Drumpellier RFC which currently play out of Drumpellier RFC's traditional home ground in Langloan, Coatbridge. They presently play in the West Regional Leagues Division One (Level five). The Monklands Sailing Club is based at Hillend Loch by Caldercruix. Airdrie Skatepark and BMX track are located at Airdrie Leisure Centre. Airdrie and Monklands ASC, based at the John Smith Pool, Airdrie. Springwells Lawn Tennis Club. A member of the West of Scotland District and LTA County, divisions of Tennis Scotland. Airdrie hosted the National Mòd in 1993. Airdrie Public Observatory – home to a 6” Victorian telescope. Arran View - villa built by Alexander Thomson in 1867. Black Hill transmitting station – the tallest structure in Scotland. Centenary and West End Parks – including the Airdrie Cenotaph and the Centenary Railway Viaduct (1866). Drumbowie World War II Anti-aircraft battery – site number N12, part of the Clyde AA defences. Situated just outside Glenmavis. Monkland Canal – where the Vulcan (barge), the world's first iron boat, was constructed and launched in 1819. The Wallace Stone – legend tells that William Wallace sharpened his sword on this stone on his way to the Battle of Falkirk. Boys' Brigade – Airdrie, Coatbridge and District Battalion, 1st, 2nd, 3rd, 5th, 6th, 7th, 8th and 11th companies. Girls' Brigade, 1st, 4th, 5th, 6th, 7th, 8th, and 9th companies. Airdrie is represented by several tiers of elected government. North Lanarkshire Council, the unitary local authority for Airdrie, is based at Motherwell, and is the executive, deliberative and legislative body responsible for local governance. The Scottish Parliament is responsible for devolved matters such as education, health and justice, while reserved matters are dealt with by the Parliament of the United Kingdom. The town forms part of the burgh constituency of Airdrie and Shotts, electing one Member of Parliament (MP) to the House of Commons. In 2005, changes to the constituency boundaries saw part of its area transferred to Motherwell and Wishaw, offset by the addition of part of Hamilton North and Bellshill. John Smith, MP for North Lanarkshire 1970–1983 and Monklands East 1983–1994 (Eastern Coatbridge and Airdrie area). Former Shadow Chancellor and then leader of the Labour Party until his untimely death in 1994. Helen Liddell, MP for Monklands East 1994–1997, Airdrie and Shotts 1997–2005, Secretary of State for Scotland and subsequently Britain's High Commissioner to Australia. John Reid, MP for Airdrie and Shotts 2005–2010, a high-profile minister including as the first Roman Catholic to be appointed Secretary of State for Northern Ireland. The current MP for the constituency is the Scottish National Party's Neil Gray. He won the seat in 2015's general election from the Labour party, which was always seen as a safe seat for Labour. For the purposes of the Scottish Parliament, Airdrie forms part of the Airdrie and Shotts constituency. This has slightly different boundaries than that of the UK Parliament constituency of the same name. The current member of the Scottish Parliament for Airdrie and Shotts is Alex Neil MSP (Scottish National Party), who won this seat in the 2011 Scottish Parliament from the Labour Party who had held the seat since the instatement of the Scottish Parliament in 1999. In addition to this Airdrie is represented by seven regional MSPs from the Central Scotland electoral region. They are: Linda Fabiani (Scottish National Party, SNP), Jamie Hepburn (SNP), Christina McKelvie (SNP), Margaret Mitchell (Scottish Conservative Party), Alex Neil (SNP), Hugh O'Donnell (Scottish Liberal Democrats), and John Wilson (SNP). Up until 1975, Airdrie had its own Burgh Council. Between 1975 and 1996, Airdrie came under Monklands District Council operating in conjunction with Strathclyde Regional Council. Monklands District Council was headquartered in the Coatbridge Municipal Building. Many Airdrieonians felt short-changed by MDC's actions and a significant political scandal known as Monklandsgate greatly tarnished the Council's reputation. After 1996, it came under the authority of the unitary North Lanarkshire Council. North Lanarkshire has many councillors; currently, the council is in control of the Labour group and the leader of the council is Jim Logue, councillor for Airdrie Central. Policing in Airdrie is undertaken by Police Scotland. Airdrie is part of Coatbridge Area Command with Chief Inspector Kenny MacLeod as the Area Commander. Airdrie also forms part of NA (or Monklands) sub division which includes Coatbridge and the surrounding area. There is one police office in Airdrie and this is open 24 hours. Airdrie Sheriff Court provides a comprehensive local court service for the area including civil actions and criminal cases. It is administered by the Scottish Court Service and part of the South Strathclyde, Dumfries and Galloway Sheriffdom headed by a Sheriff Principal. The Crown Office and Procurator Fiscal Service, responsible for the prosecution of crime in Scotland, maintains an office in the town directly opposite the Court. The Airdrie Hearing Centre holds Children's Hearings within the town. The Centre is part of the Central West Region of the Scottish Children's Reporter Administration. As outlined in the history section Airdrie's traditional economic activities of weaving, coal mining, and heavy industry have ceased to exist. Whilst the Glenflagler Distillery is now closed the town still retains a strong involvement in the whisky industry. Airdrie was also home to a Crimpy Crisps factory. It is fair to say that, given its location near to Glasgow and other commercial or industrial areas, Airdrie might now be considered something of a commuter town. In fact housing construction in Airdrie has been very prominent in recent years with builders developing a number of brownfield sites following the closure of various factories such as Boots who closed their factory in 2004. Nonetheless it does retain significant economic activity. Albert Bartlett & Sons, a supplier of root vegetables in the UK. The Bartlett brothers, Alan, 52, and Ronnie, 44 are jointly ranked in The Sunday Times Rich List 2008 as the 63rd richest persons in Scotland and the 969th richest persons in the UK with a worth valued at £80 million. Inver House Distillers Limited, headquarters and warehousing in Airdrie. Products include Old Pulteney, Balblair, Heather Cream and Coldstream Gin. Teleperformance, a telesales and technical support company. There are two trading estates in the town, Brownsburn Industrial Estate and Osprey Trade Park. Historical records of Airdrie's population are available from the 18th, the early decades of the 19th century, and into the early 20th century. 20.7% were under 16, 16.67% were pensioners. 46.61% were married (first marriage), 29.81% were single. 95.74% were born in Scotland or described their nationality as Scottish. Christian Church of Scotland – Airdrie's Church of Scotland churches are part of the Presbytery of Hamilton. New Monkland Parish Church (bef. 1698) – In nearby Glenmavis. Roman Catholic Church – Airdrie's Roman Catholic churches are immediately governed by the Diocese of Motherwell, currently led by Bishop Joseph Toal. The Bishops' Conference of Scotland (effectively the Church's headquarters in Scotland) is situated in Airdrie. Congregational Church – Airdrie's Congregational churches are associated with the Congregational Federation. Airdrie Baptist Church (1843) – part of the Baptist Union of Scotland. Airdrie Islamic Centre (mosque) – part of the UK Islamic Mission. Airdrie Park – part of the United Reformed Church. Airdrie Reformed Presbyterian Church – part of the Reformed Presbyterian Church of Scotland, which is largely headquartered in Airdrie. Ebenezer Church (Aitchison Street) – Evangelical Church – Airdrie's Evangelical churches are Brethren and associated with the Evangelical Alliance. St Andrew's Hospice – operated by the Sisters of Charity. St Paul & St John the Baptist – part of the Scottish Episcopal Church, governed by the Diocese of Glasgow and Galloway, currently led by Idris Jones, Primus of the whole Church. Airdrie railway station is on the electrified North Clyde Line. This railway provides a frequent train service to Glasgow via Coatbridge Sunnyside and Easterhouse. In 2010, the Airdrie-Bathgate Rail Link re-opened providing Airdrie with a direct commuter train service to Bathgate, Livingston North and Edinburgh Waverley. Drumgelloch railway station serves the eastern end of the town. Airdrie has road links to Glasgow, Edinburgh, Livingston, Motherwell, and Cumbernauld and is situated close to the M8 motorway. Bus services are largely undertaken by local operators, and links to Glasgow are provided by First Glasgow and McGills. McGill's took over most of the local companies in 2016 to form its ‘Monklands’ network in Go Zone 8. The services link all the local neighbourhoods with longer distance services e.g. the 212 from Coatbridge - Caldercruix via Airdrie and Plains, or the 247 from Monklands Hospital - Kirkintilloch via Airdrie, Glenmavis, Cumbernauld and Blackwood. Airdrie is connected to the UK National Cycle Network by National Cycle Route 75. This route provides a path between Glasgow and Edinburgh. According to the Sustrans website: "there is currently a gap in the National Cycle Network route at Devol Glen, Port Glasgow." Other than the Sustrans path, there are no cycle lanes in Airdrie. Monkland Railways, formed in 1848 by the merger of the aforesaid local "coal railways". NHS Lanarkshire is responsible for the healthcare of Airdrie residents. Airdrie is home to Monklands District General Hospital with a 24-hour Accident & Emergency department. The hospital has over 400 beds and provides a comprehensive service with specialist renal, infectious diseases and ENT departments. Wester Moffat Hospital provides long term care for the elderly. Adjacent to Monklands Hospital is Maggie's Lanarkshire, part of the renowned Maggie's Centres cancer support charity whilst the Beatson Lanarkshire cancer treatment centre opened in 2015. St Andrew's Hospice is a palliative care unit with a strong emphasis on cancer care. It is operated by the Sisters of Charity and partly funded by NHS Lanarkshire. The West Central division of the Scottish Ambulance Service provides accident and emergency, and patient transport services for the town. If it wasn't for the weavers, where would the Parkinson's Self Help Group be? The Parkinson's Self Help Group (North Lanarkshire) is based in the Weavers' Cottages (1780) and provides support for people with Parkinson's disease. The SVGCA – Houses for Heroes, a charity providing suitable accommodation for permanently disabled armed forces, police and fire service personnel, maintains four houses in the town. The Scottish Association for Mental Health and the Lanarkshire Association for Mental Health maintain offices in the town. In addition there are several medical practices including the state of the art Airdrie Community Health Centre, dental surgeries, nursing homes and opticians throughout Airdrie. There are three secondary schools, 13 primary schools, two dedicated nursery schools, and one special needs school in Airdrie, all of which are run by North Lanarkshire Council. Glengowan & St Mary's Primary Schools and Nursery – Joint campus, non-denominational and Roman Catholic, co-educational – in nearby Caldercruix. New Monkland Primary and Nursery – Non-denominational, co-educational – in nearby Glenmavis. Plains Primary & St David's Primary – Joint campus, non-denominational and Roman Catholic, co-educational – in nearby Plains. Jim Lambie – Turner Prize nominated artist. Sir George G. Macfarlane, engineer, scientific administrator and public servant. John O'Neill – soldier and recipient of the Victoria Cross. William Robinson – swimmer, won silver in the Men's 200 metre Breaststroke at the 1908 Olympics in London. Jim Traynor – sports broadcaster and journalist. Sir John Wilson – Baronet (Wilson Baronetcy of Airdrie, which continues today with the 5th Baronet). Airdrie has produced more than its fair share of good footballers over the years. Alan Lawrence – Nicknamed 'Nipper'. Alan Morton – Nicknamed 'The Wee Blue Devil'. Wikimedia Commons has media related to Airdrie, North Lanarkshire. 'Old-fashioned' Scottish bank shrugs off economic crisis, Aljazeera English, 28 February 2009, YouTube (2 min). Airdrie Savings Bank has now closed. Some shots of Airdrie can be seen in Lanarkshire Industrial Development Council's "County of the Clyde". ^ Not including outlying villages Calderbank, Caldercruix, Chapelhall, Glenmavis, Greengairs, Plains and Wattston which are recorded separately. ^ Drummond, Peter, John (2014). An analysis of toponyms and toponymic patterns in eight parishes of the upper Kelvin basin (PDF). Glasgow: Glasgow University. p. 322. Retrieved 3 July 2017. ^ Oxenham, William (2005). Welsh Origins of Scottish Place-Names. Llanrwst: Gwasg Carreg Gwalch. p. 97. ISBN 0-86381-957-5. ^ "Historical Weather for Airdrie, Scotland, United Kingdom". Weatherbase. Retrieved 23 March 2010. ^ Chalmers, George (1887). Caledonia : or, a historical and topographical account of North Britain, from the most ancient to the present times with a dictionary of places chorographical & philological (Vol 1 ed.). Paisley: Gardner. p. 246. Retrieved 5 January 2018. ^ Skene, William Forbes (1868). Proceedings of the Society of Antiquaries of Scotland (Vol VI ed.). Edinburgh: Neill and Co. pp. 91–98. Retrieved 5 January 2018. ^ Knox, James, Sir (1921). Airdrie, a historical sketch. Airdrie,: Baird & Hamilton. p. 3. Retrieved 4 January 2018. ^ "Airdrie". Monklands Memories. Retrieved 4 January 2018. ^ "Airdrie". Heraldry of the World. Retrieved 5 January 2018. ^ "1986 AIRDRIE AN OPEN AIR MARKET". Domesday Reloaded. BBC. Retrieved 5 January 2018. ^ Knox, James, Sir (1921). Airdrie, a historical sketch. Airdrie,: Baird & Hamilton. pp. 73–85. Retrieved 4 January 2018. ^ Knox, James, Sir (1921). Airdrie, a historical sketch. Airdrie,: Baird & Hamilton. p. 63. Retrieved 4 January 2018. ^ Knox, James, Sir (1921). Airdrie, a historical sketch. Airdrie,: Baird & Hamilton. p. 72. Retrieved 4 January 2018. ^ Mort, Frederick (1910). Lanarkshire. Cambridge: Cambridge University Press. p. 151. Retrieved 4 January 2018. ^ Knox, James, Sir (1921). Airdrie, a historical sketch. Airdrie,: Baird & Hamilton. pp. 117–119. Retrieved 4 January 2018. ^ Knox, James, Sir (1921). Airdrie, a historical sketch. Airdrie,: Baird & Hamilton. pp. 110–112. Retrieved 4 January 2018. ^ Knox, James, Sir (1921). Airdrie, a historical sketch. Airdrie,: Baird & Hamilton. pp. 125–129. Retrieved 4 January 2018. ^ Groome, Francis Hindes (1882). Ordnance gazetteer of Scotland : a survey of Scottish topography, statistical, biographical, and historical (Vol 1 ed.). Edinburgh: T.C. Jack. p. 36. Retrieved 5 January 2018. ^ Knox, James, Sir (1921). Airdrie, a historical sketch. Airdrie,: Baird & Hamilton. pp. 150–151. Retrieved 4 January 2018. ^ Begg, James (1845). The new statistical account of Scotland (Vol 6 ed.). Edinburgh and London: William Blackwood and Sons. pp. 244–245. Retrieved 3 January 2018. ^ Knox, James, Sir (1921). Airdrie, a historical sketch. Airdrie,: Baird & Hamilton. pp. 112–116. Retrieved 4 January 2018. ^ Knox, James, Sir (1921). Airdrie, a historical sketch. Airdrie,: Baird & Hamilton. pp. 120–121. Retrieved 4 January 2018. ^ "Stanrigg 9th July 1918". Scottish Mining Website. Retrieved 12 May 2017. ^ "Reserved and devolved matters". Scotland Office. Archived from the original on 4 October 2006. Retrieved 2006-11-14. ^ Paterson, Colin (6 May 2011). "Scottish Election 2011: Seven MSPs on Central Scotland list". Airdrie & Coatbridge Advertiser. Retrieved 10 August 2013. ^ "Member and Committee Information". North Lanarkshire Council. Retrieved 6 August 2016. ^ "The Bartlett brothers' entry in The Sunday Times Rich List 2008". London: timesonline.co.uk. 27 April 2008. Archived from the original on 12 June 2011. Retrieved 28 January 2009. ^ Mack, William (1791). The statistical account of Scotland. Drawn up from the communications of the ministers of the different parishes (Vol VII, number XXV ed.). Edinburgh: William Creech. pp. 276–277. Retrieved 4 January 2018. ^ Knox, James, Sir (1921). Airdrie, a historical sketch. Airdrie,: Baird & Hamilton. p. 189. Retrieved 4 January 2018. ^ "Profile of Airdrie from Scotland's Census 2001". scrol.gov.uk. Archived from the original on 25 March 2009. Retrieved 28 January 2009. ^ "Route 75". Sustrans. Retrieved 7 January 2018. ^ Fraser, Douglas (18 January 2017). "Airdrie Savings Bank to close its doors". BBC news. Retrieved 4 January 2018. ^ Stewart, Gordon. "County of the Clyde". Moving Image Archive. National Library of Scotland. Retrieved 5 January 2018.